Lenovo on Sunday announced its first smart TV that will recognize voice commands and run Android 4.0 applications, getting a jump over Apple's rumored pursuit of TVs with advanced features. The K91 Smart TV will provide classic TV functionality, but also include voice control and console-quality gaming capabilities, said Nick Reynolds, director at Lenovo. Users will be able to operate TVs through voice commands instead of the traditional way of using buttons on remote controls. "This allows the user to tell the remote control what they want to do, such as accessing thousands of TV apps available running on Android 4.0, or accessing LenovoCloud service to download new upgrades, and also access personal multimedia content or interact on social networks," Reynolds said. 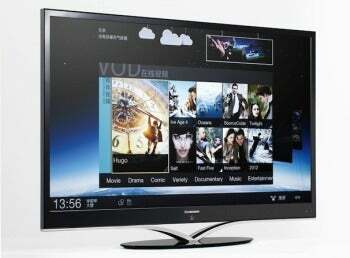 This could give Lenovo am edge over Apple, which is rumored to be pursuing the TV market with a television set. Speculation of Apple's introduction of a TV gained ground after rumors emerged from the biography of former CEO Steve Jobs that Apple was tinkering with the idea of creating an easy-to-use integrated TV set that could sync with other devices and Apple's iCloud service. Analysts have mostly backed the idea of Apple's imminent launch of a TV set, but some analysts have doubts. Apple already offers the Apple TV set-top box to stream movies and other content. Lenovo's new TV set, which has flicker-free 3D capability, will be shown at this week's Consumer Electronics Show in Las Vegas. Companies such as Samsung and LG have also been peddling smart TVs that can run applications like games and connect to movie streaming services like Netflix. But Lenovo wants to differentiate itself with Android 4.0, natural language processing and speech recognition technology. "As a new player in the highly competitive TV market, it is very important for Lenovo to offer significant differentiation right from the off. So the K91 is designed as a premium product," Reynolds said on a conference call. The TV set will initially launch at the end of the first quarter in China, a home market where Lenovo launches many of its first products such as laptops, tablets and smartphones. "This is a new segment for us and we will continue to look at international opportunities for expansion," Reynolds said. The TV set will be an IPS panel with 42-inch and 55-inch 3D LED displays. It will have SRS TruSurround capabilities and a 5-megapixel camera for videoconferencing and parental control features. It will run on a Qualcomm 8060 dual-core CPU running at 1.5GHZ with a power integrated GPU, 1GB of RAM and 8GB of internal storage. Lenovo envisions the TV as being the center of home entertainment with the ability to connect and exchange data with smartphones and tablets, though Lenovo did not provide further details. Lenovo is also introducing the A30 Internet TV set top box, which provides access to TV content and cloud-based games, karaoke and other content services. The box is powered by a Via Nano processor running at 1.2GHz, and is compatible with multiple video and audio formats.